Thunder rumbled in the distance, but just a few sprinkles decorated the windshield as we rolled slowly down the gravel road. With eyes trained on the roadside vegetation, we searched for clues that our quarry was near. Too dry. Too grassy. Too brushy. Too wet. Then, finally: moist soil; a clearing in the trees; and tall brown stalks marked the spot. Grabbing plastic bags and rain jackets, we clambered out of the car for a closer look. Curled up at the base of a brown stalk was a cluster of tiny curlicues. Each green stem was rolled up like the elegant scrollwork at the top of a violin. Delicate, fawn-brown flakes clung to the curlicues, like tissue paper protecting something precious. Fiddlehead ferns! Their unique pattern of emergence, called circinate vernation, protects the tender growing tip of the frond within the tightly curled bundle of leaves. The lower parts of the leaf expand and toughen up first, until finally the tip of the frond unfolds—hopefully after the danger of hard frost is past. Not only is this method of growth practical, it is lovely to observe. I had been worried that we’d waited too long (spring is so busy! ), and had missed the brief, edible stage of the Ostrich Fern. Indeed, several clusters within the patch had already unfurled their fronds completely, rendering them inedible for humans. Snapping off one or two of the tightly curled fiddleheads from each bunch, we worked to fill our bag. A swarm of blackflies encouraged us to move quickly. This wild vegetable is a spring delicacy among many people in the Northeast and Upper Midwest. With a pleasant flavor I describe as “green,” and a beautiful shape, fiddleheads can be cooked into many tasty dishes. It is important to identify your fiddleheads correctly, though, since many other ferns can cause stomach upset, and are known to contain carcinogens. Plus, they often taste terribly bitter. Ostrich Ferns, the most easily prepared edible fern around here, have a smooth stem with no hairs, light brown, papery flakes called scales that protect the emerging frond, and a deep groove on the front of the stalk. If the fiddleheads you see are covered in light orange fuzz or black hairs, leave them be. Once you’ve identified your fiddleheads correctly, it is also important to boil them before you eat them. There have been several cases of an unidentified foodborne illness after eating raw or lightly cooked fiddleheads. Steaming or boiling for 10-15 minutes seems to eliminate that risk. I like to clean and boil my bagful all at once, and then throw the cooked vegetables into a skillet with butter and garlic, or into my morning omelet. A fiddlehead tempura recipe I recently saw online looks tempting, too. Foraging also gives me an excuse to explore. Ostrich Ferns form great colonies in river bottoms, and in rich, moist, forest soils across northern North America, eastern and northern Europe, and northern Asia. Their name comes from their huge, elegant, plume-shaped leaves. They can grow from the spores released from the odd-looking brown frond that sticks up from each clump all winter, and marks the patches each spring. Or they can spread through underground stems called rhizomes. The intricate network of rhizomes in a dense patch of ferns can help reduce soil erosion. For many reasons, it is important to harvest fiddleheads—or any wild edible—responsibly. The University of Maine did research on the effect of several harvest methods. They found that harvesting no more than half of the fiddleheads within a single crown does not reduce the vigor of the plant. I usually stick to just one or two fiddleheads from each crown, and skip the smallest clumps altogether. As our bag filled, the rumble of thunder faded into the distance and was replaced by a cheery blue sky. When a slight breeze blew away the black flies, we were able to unfurl ourselves, throw off our protective coverings, and enjoy the emergence of spring. As the group of birders gathered in at the Forest Lodge Nature Trail parking area, a cold breeze scurried under gray clouds. We scanned the treetops, looking for the flitting shapes of warblers. Just as I finished talking about the new Center for Freshwater Innovation that Northland College is starting across the road, the clear song of a black-throated green warbler pierced into our circle. “Heroes in a half-shell,” I imitated the bird, using a tune that is familiar to anyone who grew up with the Teenage Mutant Ninja Turtles. A few in the group chuckled; a few looked confused. Creating fun mnemonics is one of the best parts of learning to bird by ear, I think. 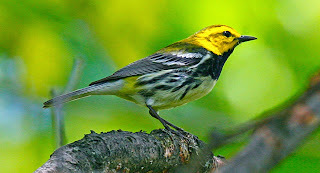 A college classmate, who had turned to nature in an effort to stay out of trouble during his childhood in Chicago, had clued me in to the black-throated green warbler’s song lyrics long ago. While bird song mnemonics may sometimes be a little anthropomorphic, I think that the value they convey by helping us remember the songs is much greater than any potential negative side effects. Professional birders, and the serious guidebooks, do describe the song more reservedly as “zee zee zee zoo zee.” Other folks, somewhere in between on the scale of birding humor, think “trees, trees, murmuring trees,” sounds more like it. The trees were certainly murmuring as the cold wind chased us into the protection of the forest. Bird songs echoed from all around us, but spotting them was a different story. The ovenbird’s ringing call: “Teacher. Teacher! TEACHER. TEACHER!” was especially common, as was the low thumping of a drumming grouse. Near a small patch of conifers, we strained to see the owner of a thin, high-pitched song. In a flash of orange, black, and white, the American redstart darted between trees and flitted about, showing the “flash patterns” on his tail. These bright patches of color can distract insect prey long enough for the redstarts to nab them with their wide, flat beak. Another glimpse of orange flashed through my binoculars as I failed to keep tabs on a blackburnian warbler. With a brilliant orange throat and striking black face-markings, these tiny insectivores are a treat to see. Seeing them is not so easy though, since they spend much of their time high in the tree canopies, with only their thin and very high-pitched song to hint at their presence. It’s no coincidence that the deep, throaty songs belong to birds (like the ovenbird and grouse) that hang out in the understory. These longer wavelengths of sound travel farther, and can push their way through more interference from branches and leaves. In contrast, birds who sing from the high canopy (like the black-throated green warbler, the redstart, and the blackburnian warbler) use piercing, short-wavelength sounds to convey their important messages through the treetops. The characteristics of high and low songs can be important at other times, too. Noise pollution, like that created by compressor stations placed in the middle of the Canadian wilderness (used to generate pressure in pipelines to keep natural gas and oil flowing from wells) or from highway traffic, can actually cause birds to raise the pitch of their songs. Although females find the low-voiced males to be sexier, in areas will noise pollution, males have to raise their pitch in order to be heard at all. This can decrease breeding success. Apparently, the first (and rarer) call we heard in the morning, was a warbler in love, trying to woo a mate from near the center of his territory. As the morning wore on, the warblers switched their calls to full-on territory defense mode. Singing from the edge of their personal space, the males were warning competitors to move on. Black-throated green warblers are a visually striking and vocally pervasive warbler of the Northwoods. Photo by John Harrison, Wikimedia Commons. After clicking on one of the bookmarks in my browser, I anxiously waited for the page to load. Slowly, a map of the continental United States appeared, and the animation started. White, yellow, and orange dots progressively filled the southern tier of states, until finally, a layer of dark red dots reached the level of central Wisconsin, just south of Cable. “Hurry up, they’re almost here!” I admonished (jokingly) to Elsa Hansen (the Museum’s new Naturalist/Curator) who was scrubbing out our old hummingbird feeder at the sink. Every spring I watch the migration maps (check them out at JouneyNorth.org) and eagerly anticipate the arrival of migrating birds. First it’s the loons (who have been yodeling on my lake for a few weeks now), and then the ruby-throated hummingbirds. Why the connections between sapsuckers and hummingbirds? They have a special relationship. Sapsuckers drill tiny holes into trees. These sapwells provide them with a variety of nourishment. Sweet liquid comes first, followed by sugar crystals as the leaking sap evaporates. Finally, insects who come and feed at the sapwells become protein-packed snacks. Hummingbirds know this, too. The males – who must arrive early to claim a territory – have the challenge of finding food before many flowers are blooming. Curiously, they will seek out sapsucker trees as a source of tree “nectar” and insects. Since hummers are relatively small, sapsuckers seem to act charitably toward their tiny dinner guests. Freeloaders they are not, though. Male humming birds are extremely defensive of their food sources, and so chase off a multitude of other birds and critters who might sip more than their fair share of the sap. Thus, both the hummingbirds and sapsuckers benefit. Of course, hummingbird feeders can also be an important source of nourishment to the early birds. Hence, our push to get the old feeder out of storage and hung up outside. From Elsa’s furious scrubbing, frustrated noises, and questions like “how do I get the black stuff out of that crevice,” it became clear that we were due for a new feeder. While it’s not necessary to boil the sugar water to sterilize it, it is important to keep your hummingbird feeders sparkling clean, and change the water before the black stuff starts to grow. This one had been put away dirty last fall, and was now a lost cause. Sun-brittled plastic and broken bee guards finalized the decision. “No!” I gasped in disgust, startling a customer at the end of the isle. Red food coloring is a dangerous additive to hummingbird nectar. No, it’s not the carcinogenic Red Dye No. 2 that was banned in 1976. But its replacement, Red Dye No. 40, has been banned in Europe, while simultaneously being approved by the USFDA for consumption in small quantities. 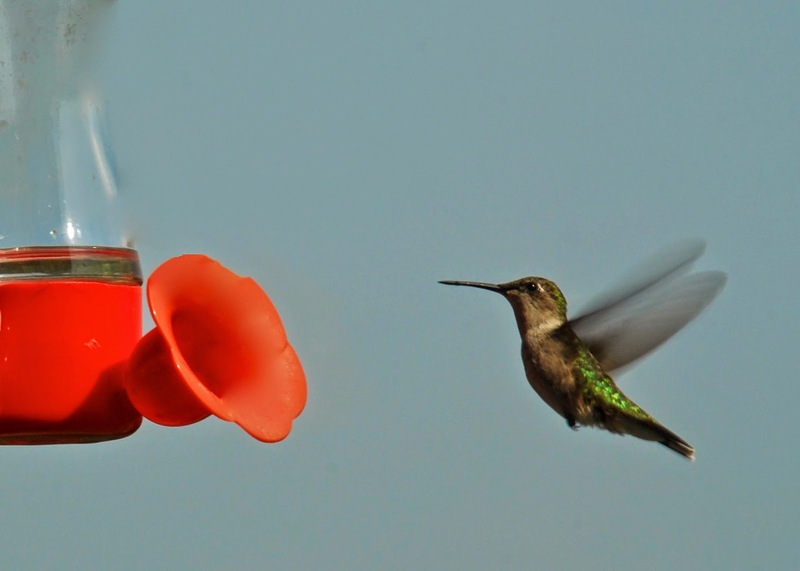 The catch is that hummingbirds don’t consume nectar in small quantities. In order to power their flight muscles (at 53 beats per SECOND) and their metabolism (at more than 1260 heartbeats per minute), hummers eat more than twice their own bodyweight in nectar and insects each day. At this rate, while including a normal proportion of flower nectar, feeder nectar, and insects in their diet, the average hummingbird would ingest 12 times the amount of red dye shown to cause DNA damage in mice. And the mice weigh four times more. While there is no money available to fund a study on the effects of red dye on hummingbirds, it is safe to say that not using it will save you money, and probably save their lives. I shook my head and headed home, bright-red, easy-cleaning feeder in hand. With great anticipation, I poured ¼ cup of plain white sugar into a 1 cup Mason jar, screwed the lid on tight, and shook. Soon the crystals dissolved and the water cleared. I filled the feeder, hung it outside my window, and opened my laptop to check the migration map again. A red dot had now appeared in Ashland, WI, a little to my north. They’re here! Just then, I caught a movement out of the corner of my eye. Zoom! He buzzed past the feeder, his ruby throat shimmering in the evening sun. Closing my laptop now, I scribbled “FOY hummingbird” into my journal, smiling the whole time. The flute-like notes of a hermit thrush wafted through my bedroom window. “Whyyyyy don’t you come with me?” he sang in a rising scale. I didn’t even open my eyes in the pre-dawn gray, but I did smile to myself. Spring has felt slow this year, because of the long period between snowmelt and green-up, but it is finally here. My favorite way to celebrate spring is with a hike up St. Peter’s Dome in the Chequamegon-Nicolet National Forest. Gentle slopes, plentiful moisture, deciduous trees, and interesting rocks enrich the soil, which supports an amazing array of wildflowers. In comparison, the sandy hemlock grove near my house is a barren desert. The evergreen shade there doesn’t allow enough of the sun’s energy through to the forest floor to support much of a ground layer. I suspected that I might still be a little early for the majority of blooms, but I just had to see what was up. Cut-leaved toothwort, blue cohosh, wood anemone, bloodroot, and wild leeks all poked their little leaves and buds out of the floodplain of Morgan Creek. The pale, fuzzy leaves of wild ginger were just beginning to sprout from its horizontal stems (called rhizomes) that snaked along, half-buried in the rich, moist soil. The wild ginger caught my eye because its rhizomes were more bare than usual, with just a few cloaks of leaves here and there. Crouching down for a photo, I wondered if it was the foot traffic of people avoiding a mud puddle, or some other culprit that caused this exposure. Then I moved a little clump of dead leaves, and the tiny, pinkish point of an earthworm shrank away from the sunlight. Ah ha! While European earthworms (brought here with ship ballast or in root balls) are wonderful at breaking down organic matter and mixing the soil in our gardens, they are just too efficient for the plants in our woods. Our northern forests evolved in the absence of earthworms, after the glaciers froze them out. Many plants here need thick, slowly decomposing leaf litter to grow, and for their seeds to sprout. In this exposed patch of ginger rhizomes, with the continued possibility for nighttime frosts and a lengthening drought, it is easy to see why fallen leaves are important. Repercussions of the worms’ voracious feeding extend throughout the forest. The three-leaved clumps of trilliums unfurling themselves along the trail, with white buds that will be open by the time you read this, decline in worm-infested habitats. Other common summer plants (just now emerging! ), like arching stems of Solomon’s seal, the thickets of wild sarsaparilla, and even sugar maple seedlings—the next generation of maple syrup—are also at risk. In their place, a lovely, green lawn of Pennsylvania sedge fills in among the trees. With the lower diversity of plants on the forest floor, ovenbirds (a vociferous, ground-nesting warbler) are much more susceptible to nest predators like squirrels and other birds. One study, conducted in the Chequamegon-Nicolet National Forest just a few years ago, found that ovenbird numbers decline by about 25% in worm-infested maple forests. Happily, the same research project also found that three other species of ground-nesting birds—the hermit thrush (who woke me up), black-and-white warblers, and veery—are not affected by earthworm invasions. As I put more space between me and the trailhead, the signs of worms faded quickly. Tiny, white, pants-shaped buds of Dutchman’s britches readied themselves for opening next to pink-striped spring beauties that were already attracting bees. Tiny leaves at the tips of chokecherry twigs glowed crimson in the sunlight. We all warmed up in the strengthening sunlight and on the steepening trail. Spotted salamanders have already returned to a vernal pool just under the top of the Dome. Their clusters of round eggs—clear with black centers—rest among films of algae, layers of leaves, and tiny, wiggling larvae. I didn’t see any signs of worms up that high, which is fortunate. One study looked at the response of salamander populations to earthworm invasions, and found that “Salamander abundance declined exponentially with decreasing leaf litter volume.” Salamanders need lots of leaf litter to house the tiny critters that they eat. These woods are changing – by the century, the year, and the hour. Some changes – like the graceful unfurling of petals, the delicate emergence of leaves, and the lyrical return of warblers—are welcome. Other changes may be more troubling. “Oh, to love what is lovely, and will not last! What a task to ask of anything, or anyone, yet it is ours, and not by the century or the year, but by the hours.” –Mary Oliver, Snow Geese. Trilliums decline when earthworms invade their habitat. Happily this one is still surrounded by a healthy carpet of leaf litter. Photo by Emily Stone.